The method can be based on the phase margin in which the controller is designed to provide a minimum phase margin. The design makes use of Bode plots. 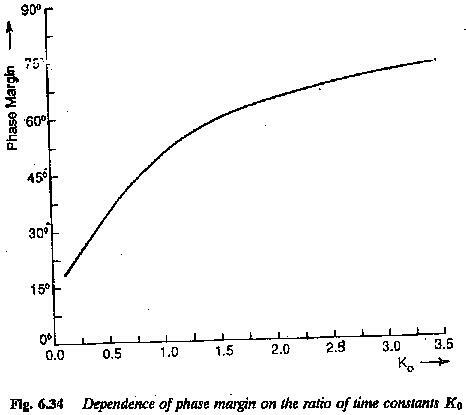 The ratio of time constants can be decided depending upon the phase margin required, which directly influences the damping. Therefore this method has an advantage over the previous one. As the damping factor increases the phase margin also increases. 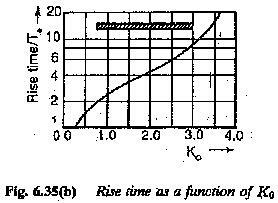 Therefore a clear dependence of these quantities and the effect of the ratio of time constants on the time response of the system is clearly brought out in the following, so that a proper design of the controller to give the desired performance can be made. 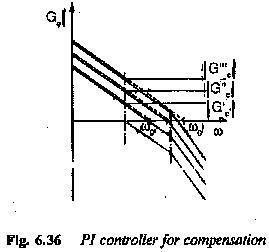 The design based on magnitude optimum gave a controller having its inte­grative time constant equal to twice the uncompensated time constant of the plant, i.e., T0 = 2Te. Depending on the value of required φ the value of Ko can be chosen. For a system having a known value of K0 the phase margin is fixed. The method based on magnitude optimum assigns a value of 2 for K0 and the corresponding phase margin is 65°. In the present method there is a flexibility in the choice of K0. The relation between K0 and φ is depicted in Fig. 6.34. From this it can be concluded that the integration time constant actually decides the system improvement or its damping and this is decided from the value of K0 (ratio of time constants). Smaller the value of K0 smaller the value of damping. 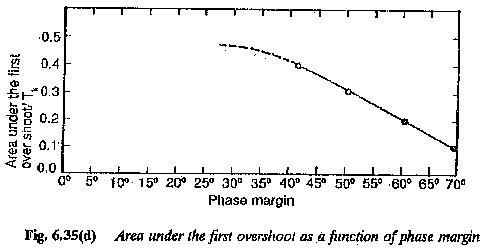 At smaller phase margins the system becomes oscillatory. The damping of the response increases with the value of K0. From the time response it can be seen that the proper value of K0 lies between one and four. For a value of K0 < 1.5 the tr < 4Te. The settling time can also be determined. The maximum overshoot as a function of K0 can be determined and is depicted in Fig. 6.35(b). From the figure it is clear that overshoot decreases as the value of K0 increases. For K0 = 1.5, % overshoot = 8.5. The area under the first overshoot as a function of K0 is also shown in Fig. 6.35(c). This is obtained by evaluating the integral. To determine a controller of suitable frequency response a detailed dis­cussion of the effects of controller amplitude characteristic on the modified system is required. The ratio K0 = T0/Te can be freely chosen while designing a controller using phase margin criterion. It has been established that the phase margin increases as the value of K0 increases. In other words the phase of the system transfer function at the gain cross-over frequency decreases. As the phase margin is related to the damping of the system the value of K0 and hence the value of T0 can also be related to damping. The damping of the system is more as the value of K0 or T0 increases. The value of T0 can be chosen freely. Its effect on the magnitude plot of frequency response is similar to the effect gain. Thus change in value of T0 can be regarded as change in gain and the magnitude plot moves along ordinate. For smaller values of T0 it moves upward, increasing the value of gain cross-over frequency. The typical amplitude plots of a PI controller used to improve the performance of the plant having one large time constant, are shown in Fig. 6.36. 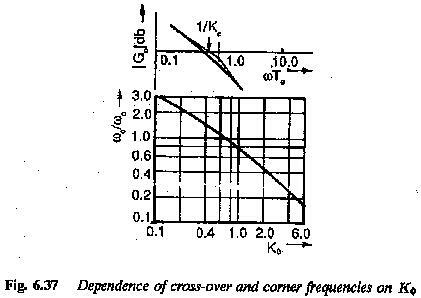 It, clearly shows that the cross-over frequency depends upon T0 and hence K0. The relationship between ωc/ω0 and K0 is shown in Fig. 6.37. The function should have a magnitude plot such that it has a slope of 20 db/decade up to the corner frequency 1/Te, where Te is the uncompensated time con­stant of the plant, and later it must have a slope of 40 db/decade so that the compensations of the two time constants is effective. Therefore, while designing a controller its amplitude plot may be freely chosen to have the necessary gain cross-over frequency. 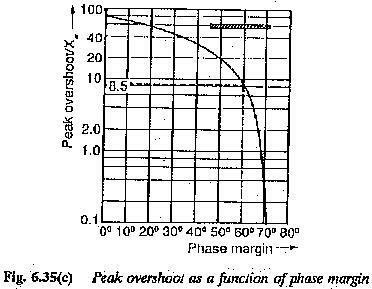 This can be achieved by shifting the amplitude plots along the y-axis until the gain cross-over oc­curs above the required phase angle (decided by phase margin). 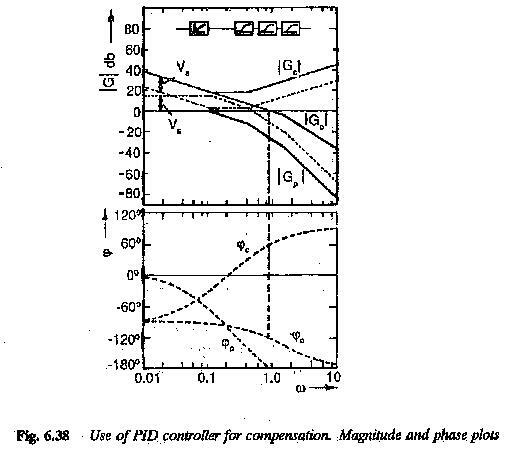 The phase angle characteristic is the resultant of the phase angle characteristics of the plant and the controller. The proper value of T0 is arrived at. The resul­tant open loop transfer function of the modified system can be determined. There will be a small difference between the value of K0 determined using the asymptotic plots and the actual calculation. If the transfer function of the plant has a gain of K, the controller will have a integration time KT0. Te is the sum of several parasitic time constants of the system. has the specified phase margin. 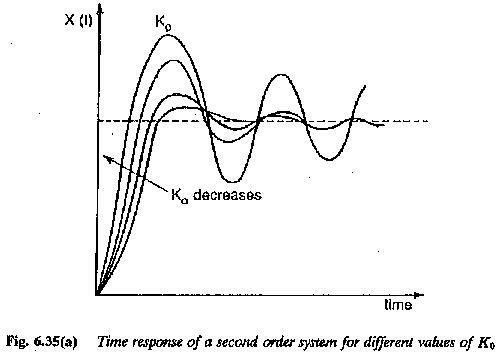 The closed loop transfer function has a time response of the second order system, having a damping ratio of √K0/2.